Books tend to be an essential ingredient in many rooms. Writers and readers turn to books to escape and decompress, which is why you’ll often find books in bedrooms. I have a bookshelf packed with a variety of reads in my bedroom –– you’d find everything from cookbook anthologies to travel books, to textbooks and bestsellers. Let’s take a look at how books can mingle in bedrooms, and create a library within each of these five spaces. This ultra-chic bedroom on the Upper West Side of Manhattan is far from the dark, stereotypical library. The faux fur adds a touch of glam while the shelves are strategically accessorized in this comfy, inviting apartment. Glossy magazines, popular titles, and a selection of classics line the shelves of the bed wall in this modern oasis. The “Womb” chair and ottoman by Saarinen is the perfect scale for the corner. What a great spot to get lost in a suspenseful or humorous novel. This Sydney, Australia bedroom comes saturated with titles and bold colors. The cut-out niches are a clever idea to break up the wall of books. 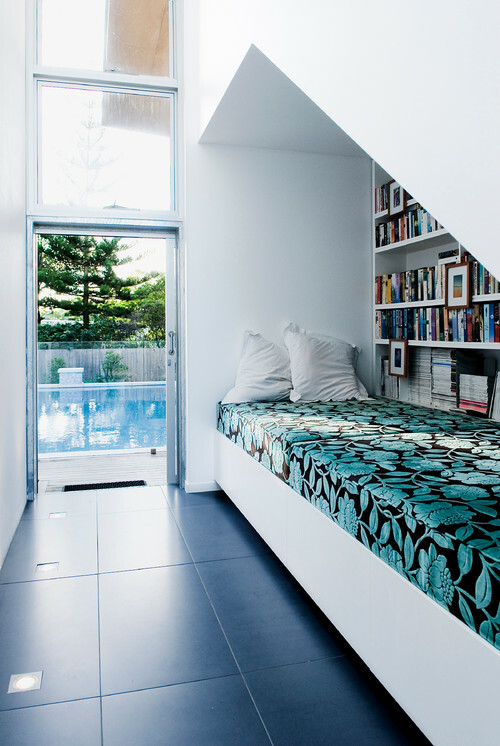 The low platform bed is a good choice, allowing the library wall to be the focal point. Brimming with natural light and boasting a pool view, this compact bedroom makes for an ideal guest nook. I’m sure the designer had bookworms in mind. 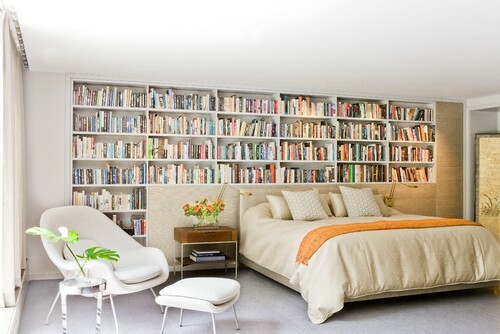 Sumptuous fabrics and contemporary art decorate this Palo Alto bedroom, which wouldn’t be complete without a custom built-in filled with great books.